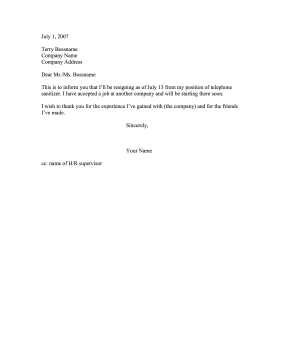 This resignation letter notifies an employer that you have accepted another position elsewhere. This is to inform you that I'll be resigning as of July 13 from my position of telephone sanitizer. I have accepted a job at another company and will be starting there soon. I wish to thank you for the experience I've gained with (the company) and for the friends I've made.